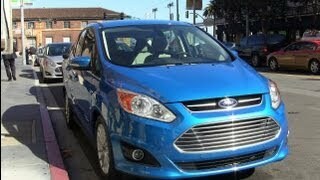 The Ford C-MAX Energi will be entering the market in 2012 and is expected to deliver a better fuel economy equivalent in electric mode than the Toyota Prius plug-in hybrid with a 500-mile overall driving range, more than Chevrolet Volt. 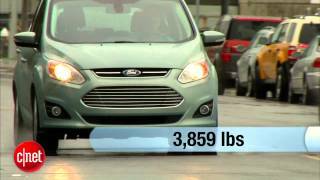 DEARBORN, Mich., Dec. 14, 2011 – Ford’s two new hybrid vehicles, the C-MAX Hybrid and C-MAX Energi plug-in hybrid, are projected to set a new benchmark for fuel economy when they go on sale next year. The C-MAX Energi is expected to deliver a better fuel economy equivalent in electric mode than the Toyota Prius plug-in hybrid with a 500-mile overall driving range, more than Chevrolet Volt. The new C-MAX Hybrid is targeted to achieve better fuel economy than Toyota Prius v.
Both vehicles feature the next generation of Ford’s acclaimed powersplit technology that will allow operation in electric mode at higher speeds than any other hybrid. “C-MAX is the right car for the time as it combines the dynamics and quality of a traditional car with the versatility of a MAV and leading fuel efficiency that you cannot even get from Toyota,” said Sherif Marakby, director of Ford’s Electrification Programs and Engineering. The C-MAX hybrids headline Ford’s transformed lineup, one-third of which will feature a model with 40 mpg or more in 2012, building on the company’s commitment to give fuel-efficiency-minded customers the Power of Choice. Ford’s near-term electrification plan calls for the company to triple production capacity of its electrified vehicle range by 2013. The C-MAX vehicles will be built on the company’s global C-segment platform and are two of five electrified vehicles Ford plans to launch in North America in 2012. Scheduled to start hitting showroom floors in the second half of 2012, the C-MAX hybrids will be built at Ford’s Michigan Assembly Plant in Wayne, Mich., with production powered in part by one of the largest solar energy generator systems in the state. Ford holds approximately 500 patents that cover technologies in its electric, hybrid and plug-in hybrid vehicles like C-MAX Energi in addition to several hundred patent-pending applications. With 20 years of Ford research and innovation behind the software and hardware technology driving them, the C-MAX vehicles also offer a proven design and nameplate with more than 100,000 sold in Europe since it launched in late 2010. The C-MAX hybrids will be the company’s first dedicated hybrid vehicle line and the first MAV (multi-activity vehicle) line in North America. C-MAX Hybrid is projected to deliver class-leading fuel economy and beat the Toyota Prius v in both city and highway equivalent miles per gallon. C-MAX Energi is projected to deliver better fuel economy in electric mode than the Toyota Prius plug-in hybrid and is projected to achieve more than 500 miles of overall driving range. The C-MAX line hits impressive fuel efficiency and range figures without sacrificing driving performance. “With C-MAX, you get road-holding capability, sportiness and performance in addition to leading fuel economy, great versatility, great features and great technology in a package designed to exceed customer expectations,” said John Davis, C-MAX chief nameplate engineer. The C-MAX line features the company’s innovative hands-free liftgate that allows quick and easy access to the cargo area without ever needing to fumble for keys. A gentle kicking motion under the rear bumper opens the liftgate when used in combination with a key fob the user keeps in his or her pocket or purse that tells the car it’s OK to engage. The same motion can be used to close the liftgate. The vehicles also feature the newest version of SYNC® with MyFord Touch® to help inform, enlighten, engage and empower drivers – with an emphasis on increasing fuel economy. This feature offers multiple ways for customers to manage and control their phone, navigation, entertainment and climate functions through voice commands, menus accessed through controls on the steering wheel, touch screens, buttons or knobs. In C-MAX Energi, the system offers additional information such as battery state of charge and distance to the next charge point. The C-MAX also offers the next generation of SmartGauge® with EcoGuide. Designed to help drivers get the most from the C-MAX, information such as instantaneous fuel economy can be displayed on the left cluster to help drivers more closely monitor how their driving behavior affects the vehicle’s efficiency. In the right cluster, redesigned imagery of green leaves shows overall driving efficiency. The left cluster shows Brake Coach, a feature that helps drivers optimize their use of the regenerative braking system so that driving range can be enhanced through proper braking techniques. Available for C-MAX Energi is the MyFord® Mobile smartphone application that allows users to monitor charging, receive alerts, find charge stations, plan trips and do more from their smartphones or computers for an effortless transition to an electrified vehicle lifestyle. Other available technology features on C-MAX include active park assist, push-button start, AM/FM/CD/MP3 Sony® Audio, HD Radio™ and voice-activated Navigation System. 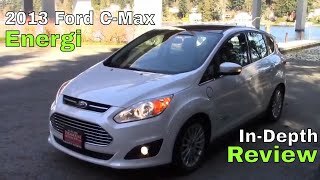 As Ford’s first North American MAVs, C-MAX Hybrid and C-MAX Energi provide customers with plenty of interior versatility and flexibility along with the urban maneuverability of a smaller vehicle. The C-MAX line features a high roof design that gives each vehicle an overall height of 64 inches along with a higher command-style seat position instead of a cockpit-type. It also features five-passenger seating that includes a split, fold-flat second-row seat. C-MAX Hybrid provides 54.3 cubic feet of space behind the first row and 24.9 cubic feet behind the second row. In C-MAX Energi, there is 43.3 cubic feet behind the first row and 19.1 cubic feet behind the second row. Although Ford’s C-MAX vehicles are new, the software and hardware technology going in them has been evolving for nearly two decades. The C-MAX line also benefits from analysis of more than 500,000 miles of data collected from Ford’s Escape plug-in hybrid test fleet, which helped engineers understand how plug-in hybrid vehicles are driven and charged and how parts perform under certain conditions. C-MAX Hybrid and C-MAX Energi get their power through the combination of a gasoline engine and a battery-driven electric motor. When powered by gasoline, the C-MAX Hybrid and C-MAX Energi use the all-new 2.0-liter Atkinson-cycle four-cylinder engine – a powerful and fuel-efficient engine and among the most advanced non-turbocharged four-cylinder powertrains Ford has ever offered. The electric motors of the C-MAX hybrids are powered by advanced lithium-ion (li-ion) battery systems designed to maximize use of common, high-quality components, such as control board hardware that has proven field performance in Ford’s critically acclaimed hybrid vehicles. Li-ion battery packs are more efficient than nickel-metal-hydride (NiMH) batteries. They also are 25 to 30 percent smaller and 50 percent lighter than NiMH batteries used in today’s first-generation hybrid vehicles. C-MAX hybrids offer Ford’s next-generation powersplit architecture that allows the electric motor and gasoline-powered engine to work together or separately to maximize efficiency. The engine also can operate independently of vehicle speed, charging the batteries or providing power to the wheels as needed. The motor alone can provide sufficient power to the wheels in low-speed, low-load conditions and work with the engine at higher speeds. In the C-MAX Hybrid, the li-ion battery pack is recharged when the gasoline engine is in operation. Further, the regenerative braking system recaptures more than 95 percent of the braking energy that would otherwise be lost, and is able to use that power to help charge the battery. C-MAX Hybrid requires no plug-in charging. C-MAX Energi is charged by connecting the vehicle’s external charge port to either a standard 120-volt outlet or available 240-volt charging station. The C-MAX hybrids offer standard safety technologies such as the MyKey® teen safety feature, SYNC 911 Assist™ and seven airbags. SYNC 911 Assist uses hands-free phone capabilities to connect the driver directly with a local 911 operator through the paired phone should an accident occur in which an airbag deploys. The next-generation MyKey features now allow parents to choose from multiple top speed limits and blocking of explicit satellite radio programming. MyKey also provides a persistent audible warning if front occupants are not wearing seat belts. The C-MAX hybrids also feature standard safety and driver-assist technologies, including Curve Control that is designed to slow the vehicle when it’s cornering too fast and Torque Vectoring Control to help accelerate through a turn when necessary. AdvanceTrac® with Roll Stability Control™ (RSC) and electric power-assisted steering (EPAS) also are standard.